This article is 196 days old. 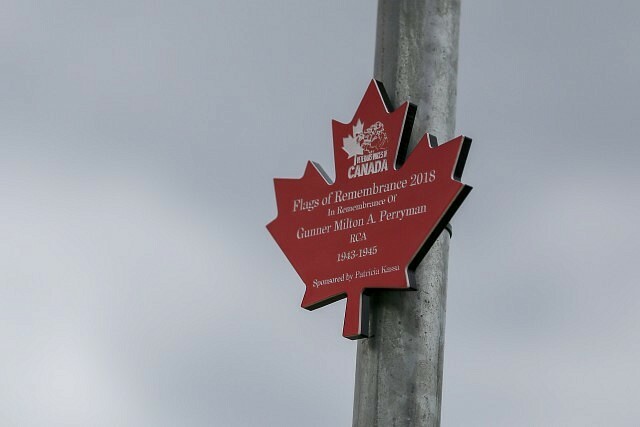 For the second year in a row, honour plaques were stolen off their flagpoles along the riverfront. According to organizers, ten were taken sometime overnight Wednesday. Plaques also went missing during last years display prompting organizers to install surveillance cameras at the site this year, and they hope to catch those responsible. The flags and plaques were unveiled on September 22nd as part of a project with Veterans Voices of Canada. Each flag is representing a Canadian who was killed or has gone missing during the Boer war and war in Afghanistan. Just to be safe, the remaining plaques were removed on Thursday by organizers, but the flags remain up.